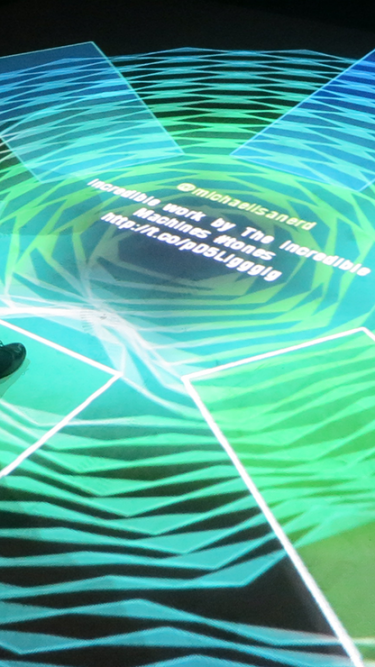 #Tones is an immersive experience that breaks the mold of traditional social media visualization. #Tones allows players to collaborate in a unique form of music-making by controlling virtual instruments with their bodies. They can also add lyrics to the song by Tweeting phrases to the designated hashtag, which changes from event to event. Players visually transform their surroundings as they interact with the responsive projections on the floor and their bodies. After installing multiple iterations of #Tones, Incredible Machines have developed a custom rig that orients all of the components needed for object tracking and projection mapping. It houses eight infrared lights, three short-throw projectors, and a wide-angle infrared camera and is flexible enough to work in locations with ceilings as low as ten feet. This setup allows IM to create large trackable areas in very tight spaces. IM’s object tracking application uses OpenCV and openFrameworks to locate players and transform their movements into programmatic animations that can be skinned in different visual styles. It also pairs with Ableton Live to allow an infinite variety of sonic environments. #Tones was featured at the 2013 Dumbo Arts Festival and premiered in partnership with Twitter at SXSW 2013. Incredible Machines also have installed it at a variety of high-profile music festivals including 2013’s RiotFest 2013 and Electric Zoo. We designed #Tones to represent a more present and active way of using technology to interact with one another. While it leverages social media, it does so in a fun and playful way that provides a sort of inside joke only to those present in person. The actual musical controls are intuitive enough for anyone to master; they merely require that you let loose and engage in fun, physical play with the people around you.